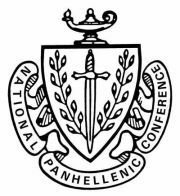 I understand that the information set forth above shall be released to the Jackson Panhellenic Alumnae Association and that such information shall be further distributed to various alumnae groups and universities. NOTICE: PLEASE CLICK SUBMIT FORM BUTTON ONLY ONCE. PROCESSING MAY TAKE A SHORT WHILE.